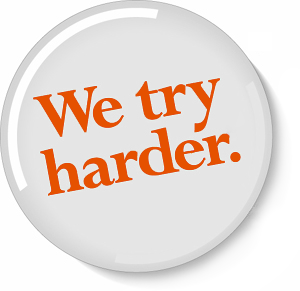 In 1962, Avis (a car rental company from US) decided that they should take advantage of their status as the second largest car rental company in the US, so they adopted the motto: "We Try Harder". The new company statement was such a success that they soon became no. 1 in their branch and the motto stuck with the company for 50 years (until 2012). This isn't just a successful rebranding story, but also a good way to deal with the fact that although you may not be the first choice, you do your utmost to improve and meet the requirements. In the end, this proves to be worth more than doing business with the best in the field, as it reassures the customer of your commitment. As a software outsourcing company, we do find it sometimes difficult to compete with in-house IT departments, mostly because we are seen as outsiders who can't really fit in, understand the development requirements and deliver quality software. Well, as an answer to all these types of comments about outsourcing, I have to say that: Yes, we are not a department within your company, but as an outsourcing company we do try harder to meet your requirements, to meet the deadlines and to provide a smooth communication. As you can see, our responsibilities as an outsourcing company are quite a few, and we do try to provide the best solutions and advice for every given situation. Of course, you may say that the language and the fact that we are in Romania are an important barrier in the software development process, but I would argue by saying that: as an offshore / nearshore company we do have a good knowledge of the English language (written and spoken), and thanks to the geographical distance there's also a timezone difference - meaning that we may, sometimes, get the job done while you are sleeping :). As far as communication goes, we provide our customers with daily feedback and weekly / monthly statuses, so you can easily keep track of our work. I agree, you (as a customer) can not check and control every aspect of the software development process, but this also means that you don't need to bother about every little detail in the process. We, the outsourcing company, will deal with most of the requirements of the software implementation and testing, and you'll just have to test the milestones and adjust the requirements according to your needs. So you'll still have the control over the final product: how will the software product look and feel. We are aware that the software development process can be a bumpy road sometimes, due to the technological limitations and applications incompatibility, but we also know that we can find the most suitable workarounds, so that in the end we deliver the software product that you envision. Also, as an offshore / nearshore company, we may not be physically at your location, but we are just an email away; and if you want to, you can even come and visit us, and maybe stay for a cup of coffee :). Software development is not always a smooth process, and you may think that outsourcing means losing control of the end product and putting quality at risk, but because of that we try harder to fit into your organization, to meet your requirements and to become your colleagues. Cost is always a big factor why companies are outsourcing software development. The savings can be substantial because you will only pay for the services on a per project basis. I think everyone should read your blog who want to good information about Offshore Software Outsourcing services. Thanks and keep it up! I think business should always consider outsourcing non-core business hence any company which core business is not software development should consider outsourcing.